For a while, I've been wondering about how the small human bone fragments that have been found in some Irish passage-tombs came to be in such a fragmented condition. 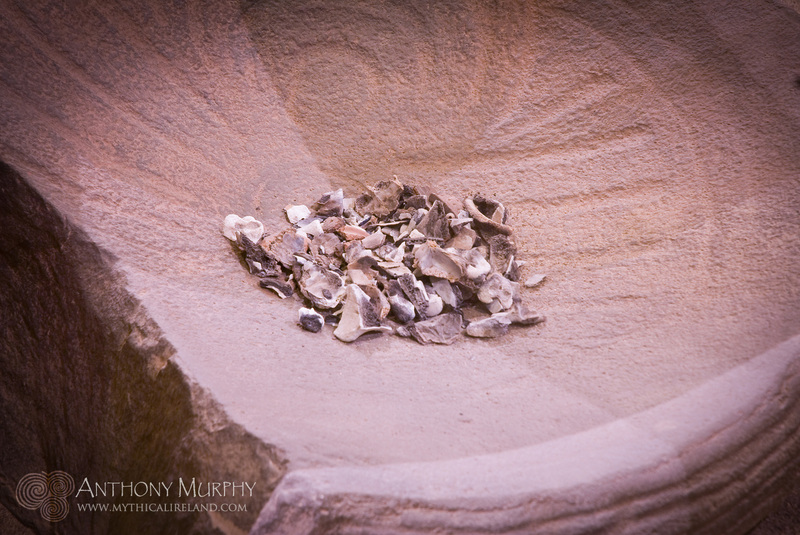 In terms of the unburnt bone human fragments found during the O'Kelly excavations at Newgrange, "apart from some complete hand and foot bones, all human specimens consisted of small fragments". (O'Kelly, Newgrange: Archaeology, Art & Legend, Thames & Hudson, 1982). Replica of basin stone from Knowth's eastern chamber with bone fragments. There were a total of 750 unidentifiable fragments. 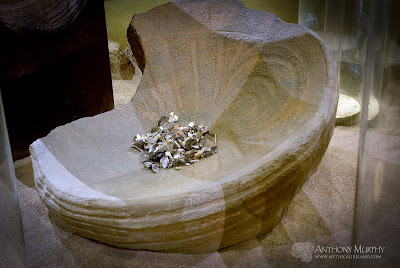 The fragmented remains of dozens of individuals were found in the chambers of nearby Knowth. Layers of fragmented remains were found in the passage and chamber of Fourknocks. So how do human bones - those that are not cremated - become so fragmented? Searching through my extensive archive of research material, I found an interesting article from the Sunday Times from July 2003. 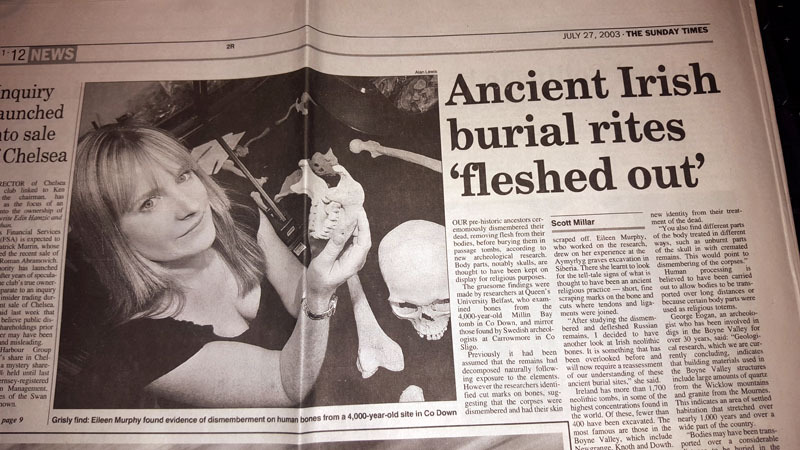 Eileen Murphy of Queen's University Belfast had studied Irish neolithic bones and found that our early ancestors had dismembered and defleshed their dead. Murphy had worked on the excavation of graves in Aymyrlyg graves in Siberia, Russia. There she learnt to look for the tell-tale signs of what is thought to have been an ancient religious practice - short, fine scraping marks on the bone and cuts where tendons and ligaments were joined. "After studying the dismembered and refleshed Russian remains, I decided to have another look at Irish neolithic bones. It is something that has been overlooked before and will now require a reassessment of our understanding of these ancient burial sites. The researchers from Queen's made the findings when examining bones from the 4,000-year-old Millin Bay tomb in County Down, and the discoveries mirrored those found by Swedish archaeologists at Carrowmore in Co. Sligo. The Sunday Times article described how body parts, notably skulls, are thought to have been kept on display for religious purposes. In these tombs you rarely find single skeletons, but rather groups of cremated remains. In this way these neolithic people would seem to have been creating a new identity from their treatment of the dead. You also find different parts of the body treated in different ways, such as unburnt parts of the skull in with cremated remains. This would point to dismembering of the corpses. by the process of natural outdoor excarnation? Not all corpses were dismembered by other humans. The process known as excarnation, or defleshing , is well documented. This involves leaving the human corpse out in the open (sometimes known as sky burial), or in a cave, for the elements and wildlife to assist in the process of speedy decomposition and dismemberment. Some "excarnation sites" were outdoors, while others were in caves. It is estimated that a human corpse left out in the open can be reduced to a pile of bones in a matter of weeks or months. However, there seems to have been a deliberate effort made, in some cases, to slow down the process of excarnation by leaving a corpse in a cave. A chance finding of a bone fragment in a cave at Knocknarea in Sligo led to the discovery of more bone fragments belonging to an adult and a child which may have been evidence of cave excarnation. Radiocarbon dating put the age of the bones at over 5,000 years old. It is thought that the process of excarnation in a cave took much longer - perhaps up to two years - but eventually the deceased's relatives would come back to collect the bones for burial elsewhere. In the case of Knocknarea, this burial might have taken place in one of several monuments on the top of the mountain. What's also interesting in Ireland is that osteoarchaeological analysis has revealed an absence of animal scavenging marks, suggesting that the entrance to the excarnation caves was sealed during the process of soft tissue decomposition. Flint blades from Newgrange - were these used in the defleshing process? 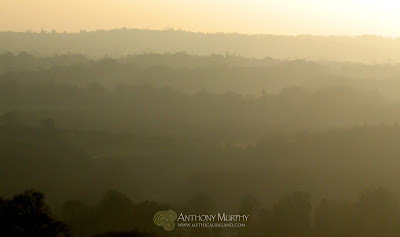 There are no caves in the vicinity of the great passage-tombs of the Boyne Valley. It would be interesting to postulate on how the fragmented unburnt remains there - and indeed at nearby Fourknocks - came to be in that condition. Of course another question that begs to be asked is how many of the flint scrapers and other flint tools found at Newgrange and other passage-tombs were used in the defleshing of human remains . . .
For years I have been drawing attention to a monument, sadly destroyed, which has been dubbed 'Ireland's Stonehenge'. This was a remarkable and unique monument consisting of several concentric circles of stone, surrounded by a large earthen embankment, all of which was encompassed by ten enormous monoliths. Ireland's Stonehenge was documented by antiquarian and astronomer Thomas Wright in 1748. His drawing is the only known representation of this once great monument, which was located in a townland known today as Carn Beg, not far from the town of Dundalk, in the north of County Louth. I first wrote about Ireland's Stonehenge in 'Island of the Setting Sun' in 2006. A 3D recreation of the stonehenge (right) by Kerem Gogus. This huge monument vanished from existence some time between Wright's drawing and brief description of it in 'Louthiana' (1748) and the construction of the Drogheda to Portadown section of the Dublin-Belfast railway line in 1855. Historian Henry Morris, writing for the County Louth Archaeological Journal (CLAJ) in 1907, gave us a tantalising insight into what the monument's purpose might have been when he wrote: "I have read or heard it stated somewhere that this place was the site of a school of astronomy. Its position on the plain, with a semicircle of mountains around would enable an ancient astronomer to observe and mark the places where the various heavenly bodies appeared on the horizon at different times of the year." Regrettably, Morris was unable to recall the source of this valuable detail. Wright's all-too-brief description of this remarkable monument, from Louthiana. 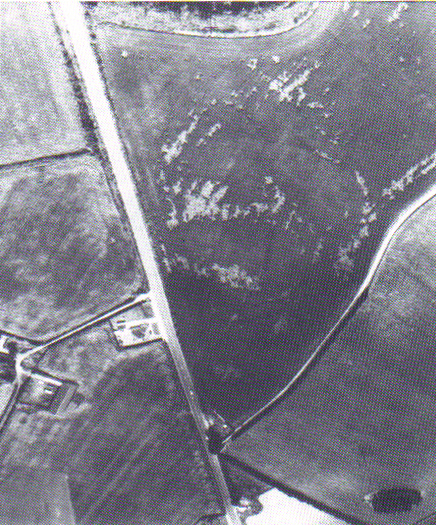 Not long after Wright's drawing was published, the Armagh Road was built, probably in the 1750s, and there can be no doubt that this was a significant factor in the destruction of the stone henge. I overlaid Wright's drawing of the monument on to Google Earth imagery of the site and this makes it obvious that at least some of the monument was flattened for the purpose of the new road. a CUCAP photo from 1970. It wasn't until 1988 that the exact location of Wright's druidic temple was finally rediscovered. 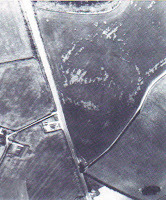 Archaeologist Victor Buckley was able to discern the monument's "footprint" in an aerial photograph which had been taken in 1970 for the Cambridge University Collection of Aerial Photographs. There was some archaeological resistivity was carried out at the site in 2006, in advance of a proposed housing development which never happened once the Irish economy collapsed. Standing at the site, which is now part of a disused golf course attached to a hotel, it is very difficult to get any sense that it was anything other than a field. There are simply no stones remaining. None. 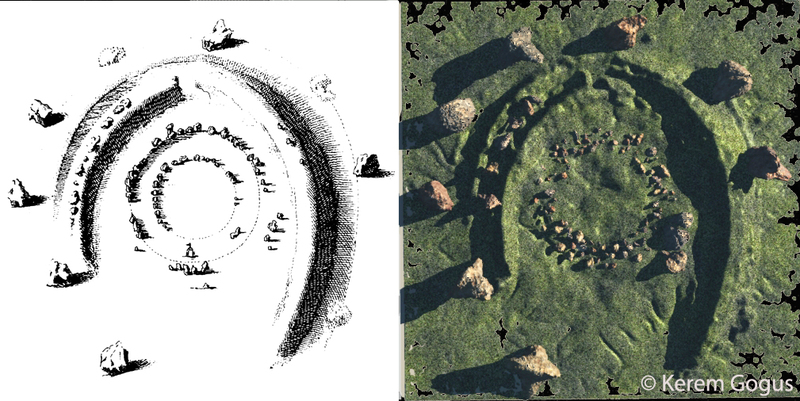 However, I've recently discovered something significant about what might have happened to the large stones - or at least some of them - in the most unlikely of sources. The remains of antiquity are very numerous, and extend through every part of the county. They continue in very much the same condition that they were found more than one hundred and twenty-five years ago by Thomas Wright, author of Louthiana. His work was instrumental in stimulating the curiosity of many of the residents of the county in regard to the precise nature of the contents of the Danish and Irish forts and Druidical camps. 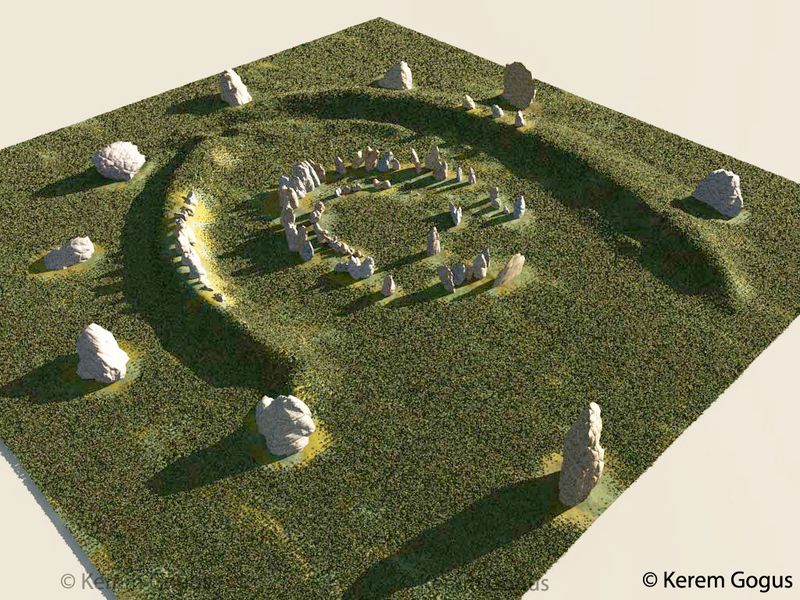 Ireland's Stonehenge in 3D based on Thomas Wright's 1748 drawing. It had not the effect, however, of preventing a tenant, near Dundalk. from effacing the Druidical circle at Ballynahatna. Of the ten stones which were said to represent the generations from Adam to Noah, only one now stands in the original position. Most of the rest were dropped into holes sunk behind them, and covered at a sufficient depth to escape the plough. This is most interesting. Bassett says that instead of bring broken up, like the smaller stones, the large ones were dropped into huge holes to bury them. This is quite exciting as it leads to the possibility that at least some of these large megaliths are still there - buried where they once stood. Perhaps this is information which might lead archaeologists towards further investigation of the site at Carnbeg? I was delighted to receive a copy of The Field Names of County Louth as a gift today. It joins my copy of The Field Names of County Meath as part of my ever-expanding reference and research library. These are both high-quality, comprehensive publications. 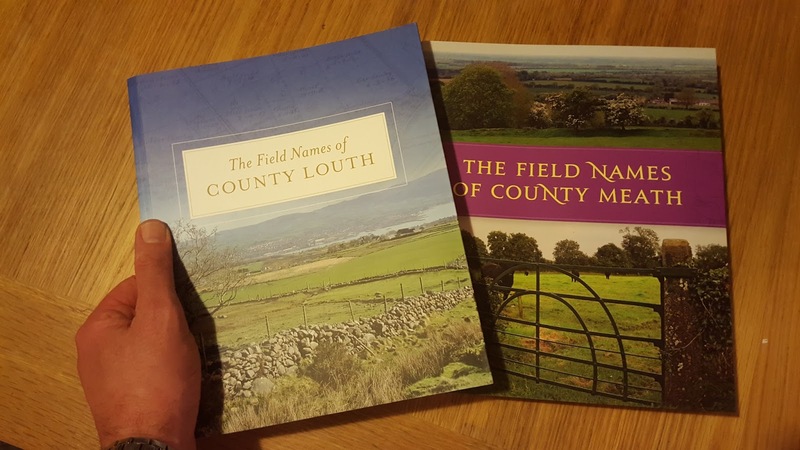 My copy of The Field Names of Louth, received today, alongside the Meath book. Many fields in Ireland have names. These books are the culmination of a long period of research and fieldwork. As the preface of the Louth book suggests, "a wealth of information not previously recorded and in danger of being lost in the sands of time has been gathered by our labourers in the field". The fairies are an enduring feature of Irish folklore. The Irish word for the fairies, sí, originally meant a mound. The sí inhabited a timeless otherworld, but they could slip between that world and this one when they so desired. There has been a long association with the fairies and natural hills, as well as prehistoric cairns and burial places (Ó hÓgáin 2006, 206). Three local versions of the name 'fairy hill' were recorded by the LFNP. They are Cruk Shee (Cnoc Sí) in Knockatober, Crogh Shee (Cruach Sí) in Baltrasna, and Crockshee (Cnoc Sí) in Haggardstown. This latter example is in fact an Anglo-Norman motte castle. Hills and mounds associated with the fairies often are sites of supernatural occurrences, like strange music. The following is from a chapter I wrote recently for a book that I've started writing, about Irish mythology and in particular the myths concerning the great monuments of Brug na Bóinne near where I live. 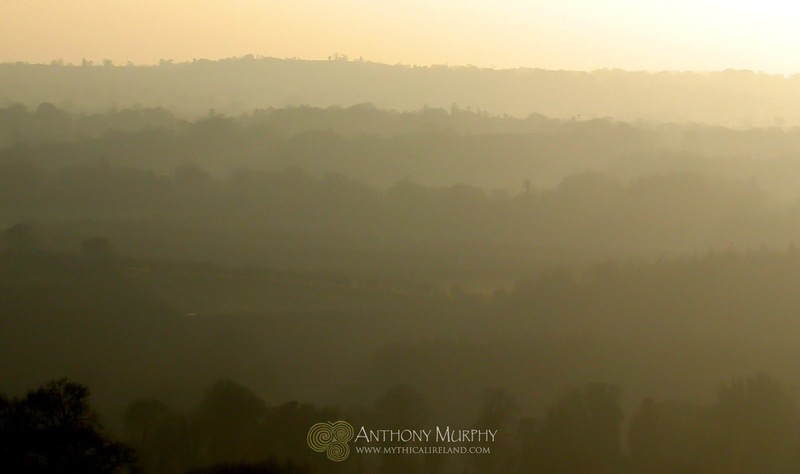 The exploration sometimes has a personal and philosophical nature which reflects my interaction with the myths of the Boyne Valley. These myths have become a source of fantastic and all-pervading influence and inspiration in my writing. Dramatic skies over Brug na Bóinne. I have forgotten the old ways, the ways of my ancestors. The old ways are dead, my son. You must learn the new ways. The old ways are not dead. They are merely sleeping, in the belly of a fish that swims beneath the nine hazels of Segais. I will wade out into the water now, towards Fiacc’s Pool, and there await the coming of my salvation. No-one can come to the Father, except through me. I do not wish to come to the Father. I wish to come to myself. I wish to some to myself through imbas, and to know myself in a way that I have never known myself. I will wait for the salmon, at Fiacc’s Pool. And in the dim Wood of the King beneath Rosnaree, I will become Finn, wanting to be with my ancestors at Brug na Bóinne. And Finegas the wise will teach me poetry beneath Knowth, while we wait for the Bradán Feasa. I cannot help you any more. Over the past few years I've taken a great interest in the creatures of Irish myth. Among the animals that have great significance in the ancient mythology of Ireland are the bull, the cow, the pig, the swan, the salmon and the hawk. 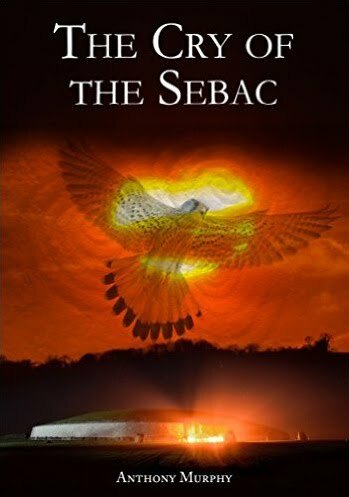 I've been greatly taken by the old story of Fintan mac Bóchra, said to have been the lone survivor of the great flood when he fled to Tul Tuinde and swam in a cave in that mountain in the form of a salmon, later transforming into an eagle, and then a hawk. A similar tale is told of Tuan mac Cairill, the sole survivor of the Partholonians, who relates the story of the Lebor Gabála (Book of Invasions) to St. Finnian of Moville. Tuan transforms into a swan, a boar, an eagle and finally a salmon. As a salmon, he is caught and eaten by the wife of Cairill, who gives birth to him again in human form so that he may recite the early history of Ireland. Thus the personages of Fintan and Tuan come to represent the idea of the embodiment or survival of ancient wisdom. Fintan is the one to whom the people of Ireland turn for advice in The Settling of the Manor of Tara, when there is confusion as to how the lands around Tara should be divided up. There are many characters, themes and narratives from Irish mythology that have inspired me in the writing of my latest work of fiction, a novel. This novel was completed earlier this year and was proofed and edited and is currently being considered for publication by a Dublin publishing company. The transformed druid in the guise of a bird of the air serves as a very vivid archetype for me, and one that I have borrowed for this latest work. A familiar voice called out to him, softly. “Why have you come here?” it said. “I have come here to live forever,” he replied, after just a moment’s thought. “What power brought you here?” the voice asked. “One person can be more powerful than an entire army,” he replied. “How did you calm the storm?” the voice asked. 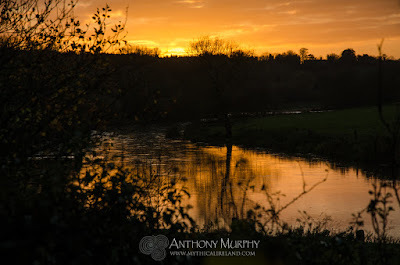 Inspired by the writings of the late John Moriarty, I included the following words in a talk entitled 'The Tuatha Dé Danann - They haven't gone away you know' to the Brigid of Faughart Festival in Dundalk earlier this year. Descend in a mist . . . arrive magically. But no nation ever conquered in spite or by subjugation or force could afterwards live a peaceful existence. Recently I've found that my senses have come into sharp focus around certain mythical imagery associated closely with the Boyne Valley area. In my spare time, I'm doing some study and research which has taken me towards examining the metaphor and symbolism of myth. This has yielded interesting results. I explained to a friend this week how I seemed to be engaged in an interesting process of following "hunches" and "leads" and that this process almost always bears fruit. When dealing with the area of science versus mysticism, I can, by and large, only deal with my own direct experiences and how they have forged my thoughts and beliefs around the whole question of the rational versus the esoteric. Currently, I am agnostic. The best and simplest definition of my agnosticism I can offer is this - I neither have proof in the existence of a god or an afterlife, or of other worlds and other realms of spirit or consciousness; nor do I have proof that they don't exist. I remain very open-minded. I am grateful for this open-mindedness. It prevents me from blindly following a path of enquiry without considering the alternatives. Recently, my work has focused on the alternatives. The sun setting above Rosnaree overlooking the Boyne river. I have been experiencing synchronicities - strange and wonderful coincidences and happenings - since the very beginning of my researches into myths and monuments years ago. I initially thought them to be what Richard Moore and I called "spooky coincidences" but over the years I've come to see them less as something to be scared of and more something to be enthralled and inspired by. My own experience has been that when a synchronicity occurs, it's like an affirmation that I'm on the right track with something. The history of science is filled with instances of noted workers in all fields who testify in their memoirs that a "hunch," a perhaps inexplicable ray of light, suddenly led them to a major discovery. Is it Newton under the apple tree, or Galvani watching his wife cook frogs' legs? Some of these invaluable "finds" seem to have been pure accidents . . . But what inspires the author of a scientific hypothesis to choose one route, one direction of approach, rather than another, when many offer themselves with equal persuasiveness to him or confront him with an equal opacity? Whence comes the "hunch," what directs the "ray of light," the seemingly lucky chance that without warning illuminates the right dark path to be followed? (Myths of Creation, Peter Owen Publishers,  (2003), p.280. "You've really hit on something here, Anthony. This is the sweet spot". Just as I thought that, I heard what might have been children's voices in the distance. I looked along the road, half expecting to see my sons and their friends coming towards me. But the road was deserted. There were no cars and no people at all, which is unusual because it's normally a very busy road. Again I thought I heard a voice or two, but this time they were above me, so I looked up instinctively, and caught sight of a formation of eight whooper swans flying southwards, directly over my head. The significance of this beautiful creature (for those of you unfamiliar with the myths of Newgrange) is that the whooper swan has been wintering at Newgrange for a long time - quite probably since before the monuments were built there 5,000 years ago. Some of the predominant myths about Newgrange, and the supernatural characters associated with it, involve swans. The most famous of these is the Aislinge Óenguso, the Dream of Angus Óg. See the Cygnus Enigma for more about the swan. Were these eight swans among the first to arrive into the Boyne Valley for the winter of 2015? Every winter, thousands of whooper swans come to Ireland from Iceland, landing en masse in Donegal and then diverging into smaller groups to winter at various sites on the island. 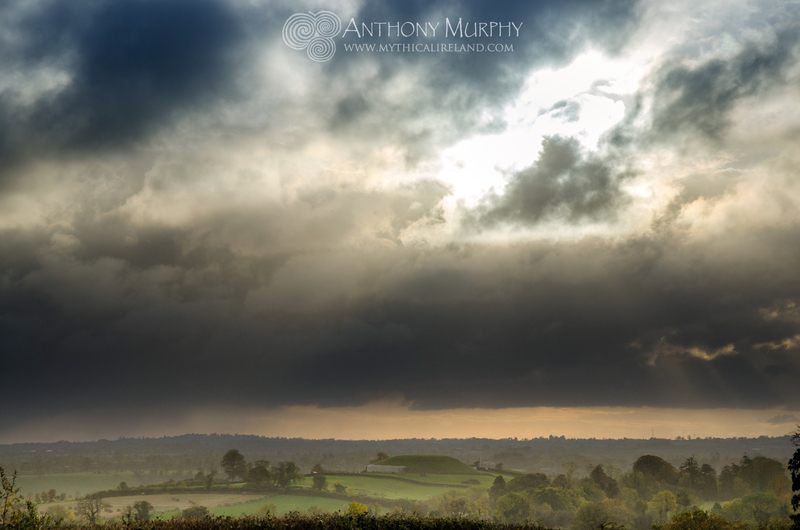 The area around Newgrange is an important wintering ground. It regularly sees more than 50 swans in winter, making it one of the predominant sites for the whoopers. Whoopers at Knowth Anthony. About 8. Just arrived. I smiled when I received it. And of course the first thing to come into my mind was the thought that perhaps these were the same eight that had flown over my head on Friday night . . . So I feel inclined to continue following these lines of mythic research that are opening up before me. There is something in the mythology of the Boyne monuments that begs to be explored, deeply and extensively, and open-mindedly, because they are more than just stories. I believe they contain an essence of what the monuments were all about, and an insight into the mind of distant ancestors. Are these stories at all relevant today? Absolutely. They are a revelation - a vista into the soul itself, and I don't believe it's at all coincidental that this mythology has survived from time immemorial to tell a story to the people of today. The process of mythic investigation has been an epiphany for me, a process of recondite introspection that has been at times both intimidating and riveting. It's brought me right into the centre of my own story on this planet . . . the reason I am here.